Check out the introduction to the project here. Day 1- fresh yeast bread is here. Today’s recipe and method comes courtesy of the River Cottage Bread Handbook by Daniel Stevens. The book goes in to quite a lot of detail about the bread making process- about thirty pages to be exact. Again, when I first got it this was something which I skimmed over so I have now gone back and read it properly. It isn’t too different from the Bertinet method from day one of the project, requiring you to stretch rather than knead the dough. The recipe was good in that it works in percentages so once you get the hang if you can play around knowing that it should always work if you stick to the correct ratios. Again not too different from the Bertinet recipe but it gives the basic recipe using 1kg flour and uses dry yeast. It also suggests that you can add a ladle full of starter if you have any (I do, so I did) and also a bit of fat. I was interested to see how much kneading would be required with this method. On day one, I worked the dough for up to half an hour so I was looking for something a little easier on the arms (although, great news for bingo wings!). The method was noticeably easier than on day one- basically stretch and turn, stretch and turn. Repeat. It took me about twenty minutes but I could feel the dough changing in my hands and although I stopped several times to clean my hands, the dough didn’t stick to the worktop anywhere near like it did on day on. The first rise took about 90 minutes to double, then I reshaped it and gave it a second rise. This took about an hour to double in size. The book suggests that you can do this three or four times if you wish, but there aren’t enough hours in the day for me. 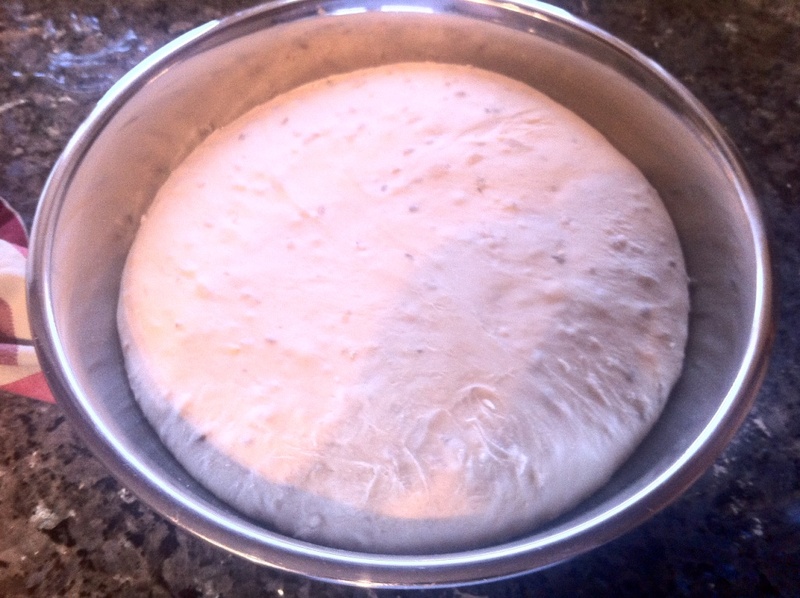 After the second rise I shaped the dough into two balls and left the prove for 50 minutes whilst the oven heated. 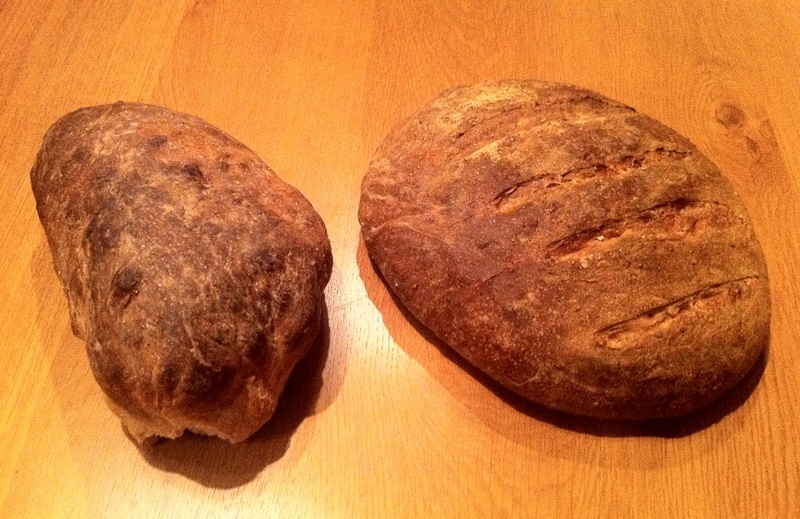 As you can see from the pictures, loaf one isn’t exactly shapely! When I took it off the mat and onto the hot tray it flopped in my hands L So when I put loaf two in I left it on the silicon mat and put the whole lot onto the hot tray and that solved the problem. Oh, I also went and got me a water bottle and sprayed the bread and the oven before the bread went in. Steam = better crust. I had to cook them separately but did them both for 10 minutes at 250c and 35 minutes at 170c – these were fan oven temperatures. Both came out well browned and passing the ‘tap test’. Loaf one was wibbly – I need to work on my shaping! As with day one, it was also still a bit claggy inside. It is cooked but still a bit damp. The problem is that the crust is dark and it sounds hollow- so I need to have the courage of my convictions and turn it down for an extra few minutes on low. Loaf two looks great. Round, the cuts have opened out and it is cooked through. Both are tasty – adding a bit of starter gives some depth to what could otherwise be dull white bread. I am alarmed by how much salt these recipes all seem to call for – is it is necessary for the yeast to work? Saying that, it doesn’t taste salty, and we have little salt in our diets anyway, so I am not going to agonise over it too much! I found the River Cottage method much easier, but there isn’t much in them in terms of taste. I am doing white bread on all three days as I think it is a good starting point, but I am already planning the River Cottage sour rye next week! 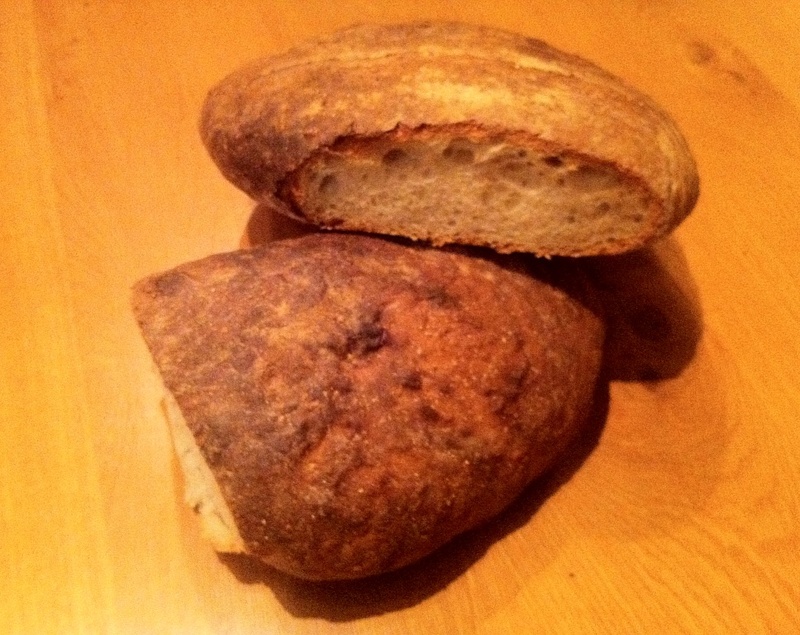 The third and final day of bread week will be Friday 13th (eek) and a sourdough recipe and method from Moro. Actually I will be starting it Thursday night as it is quite a long and slow process. Fingers crossed, the results will be worth it. Until then, it is an all you can eat bread buffet in our house- I am doing to absolute opposite of almost everyone in January and overloading on doughy delights!